Puma boys now have a 44-0 win streak in NBL dual/tri meets. They are 50-0-1 with a tie on May 2, 2012 to Cardinal Newman. Their last lost was to Newman on May 4, 2011. Puma girls win streak in NBL dual/tri meets ended at 18-0 with today’s lose. Their last lost before this was to Santa Rosa on April 12, 2016. 1600	EA	04:54.7	Ingham D.	AN	04:57.4	McCormick G.	EA	05:06.2	Perez H.	RC	05:15.7	Medina J. 110H	AN	18.1	Diecke A. 400	AN	55	Shine I.	RC	55.1	Betti D.	AN	55.4	Hill J.	RC	56.6	Davis C.
LJ	RC	21’0″, =NBL leader	Luis J.	RC	19’0″	Ortiz D.	RC	18’0″	Reagan J	RC	16’7″	Victor J. 100	RC	10.9, NBL leader	Luis J.	RC	11.2	Holzman N.	EA	12.1	Duong A	EA	12.2	Corrales L.
Discus	AN	98’5	Drake J. AN	93’3″	Perdue S.	EA	76’1.5″	Heng B.	RC	74’8″	Krause M.
800	AN	02:09.5	Thompson J.	EA	02:10.3	Ingham D.	AN	02:16.8	McCormick G.	EA	02:18.0	Perez H.
200	RC	23.3	Luis J. AN	23.4	Shine I.	RC	25	Davis C.	EA	25.4	Duong A. 300H	AN	47.5	Dierke A. AN	53	Hill J. AN	01:02.0	Miloglav L.
Shot	AN	37’6″	Perdue S.	RC	36’1″	Rankin R.	AN	35’10”	Drake J. AN	33’8″	Fox K.	RC	32’0″	Krause M.
HJ	AN	5’4″	Elliot C.	AN	5’2″	Miloslav L.	RC	5’2″	Ponzini S.	RC	5’0″	Reagan J.
TJ	RC	37’2″	Reagan B. 1600	An	05:04.2	Atkins S.	An	05:54.5	Dawson C.	RC	06:26.2	Nava N.	RC	06:33.5	Mitchell N.
110H	An	17.1	Jame M.	RC	17.6	Wild A.	RC	19.4	Hernandez L.	An	19.6	Miloglav E.
400	An	01:02.9	Windsor M.	RC	01:05.3	Monroe M.	An	01:11.4	Erlandson A. 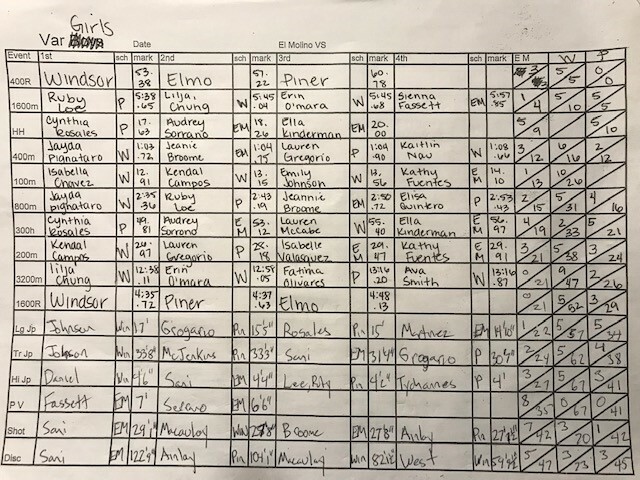 An	01:12.4	Adhikari T.
LJ	RC	14’10”	Sanchez S.	RC	14’2″	Whitehall M.
100	An	13.8	Morman A.	RC	14.2	Soriano K.	An	14.5	Brown K.	An	15.3	Alcocer J.
Discus	RC	57’5″	Lerch E.	An	56’5.5″	Alcocer J.	RC	54’5″	Stevens M.	An	54’3.5	Erlandson A. 800	An	02:28.9	Atkins.S. An	02:33.1	Dawson C.	RC	03:00.0	Nava N.	RC	03:01.7	mitchell N.
200	RC	27.3	Monroe M.	An	28.2	Windsor M.	An	29.7	Melman A. An	31.3	Brown K.
300H	An	52	Jame M.	RC	55.2	Wild A. An	57.4	Miloglav E.	An	59.2	Habeeb A. Shot	RC	20’11”	Stevens M.	An	20’9″	Alcocer J. An	16’5″	Erlandson A. 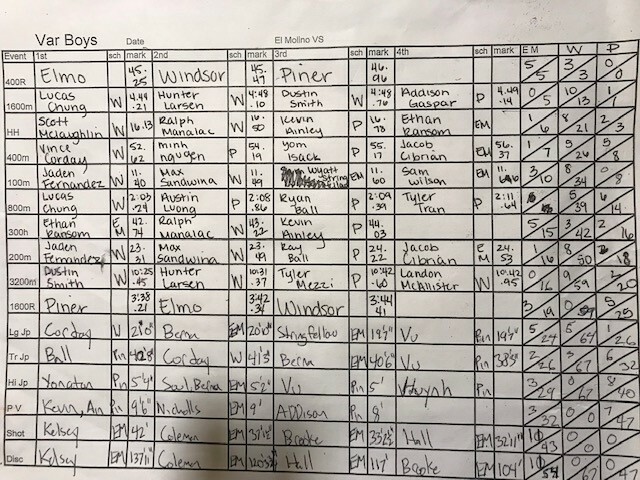 3200	An	11:34.0	Atkins S.	An	12:39.8	Dawson C.
HJ	RC	4’6″	lerch E.	RC	4’2′	Wild A.	RC	3’6′	Bell N.
1600	AN	05:25.1	Jack C-F	AN	05:34.4	Campbell R.	AN	05:45.8	Anjeh E.
110H	RC	21.8	Vallejos J. AN	22	Borba J. AN	26	Borba E.
400	AN	56.1	Meechan S.	AN	59	Rodriguez J. AN	01:01.6	Torres D.	EA	01:03.6	Cruz D.
100	AN	NT	Jennings B.	RC	NT	Augmore L.	AN	NT	Strom B.	EA	NT	Mejilla N.
Discus	EA	89’3.5″	PerezJ. AN	82’6.5″	White K.	AN	62’9″	Rice A.	EA	58’9″	Arrieta E.
800	AN	Rowan	AN	Jack	AN	Eli	AN	Anjeh E.
200	AN	25.5	Meechan S.	AN	26	Rodriquez J. AN	26.7	Moskowitz D.	AN	26.8	Jennings B. 300H	AN	52.5	Solano C.	AN	54.3	Dierke E.	RC	59.6	Vallejos J. Shot	AN	34’7″	Rice A. AN	31’9″	Moskowitz D.	AN	31’1′	Leif A.